Time flies when you are busy and I’m afraid it was way back in 2013 since my last proper blog. To be fair I have posted news of two new books, The Wyche Way and Striding Around Ross in the meanwhile. It’s been an eventful time but regrettably not all good news in that in 2014 my right knee started to pain me, in sympathy with the left knee, on which I had keyhole surgery in 2010. The same surgeon did tell me that no two knees are the same and of course he was proved right, when after the op, the right knee was still not up to any of my longer (LDWA) walks. I still had quite a lot of work to do on The Wyche Way but fortunately this was organized, in reasonable stages, and I was able to do my final recess, and also the waymarking, without too much problem. We were originally hoping to open The Wyche Way in the Spring of this year to coincide with The Malvern Walking Festival but not only were we not quite ready but Kington Walkers also said that they would like to make it the focal point of their festival in September. For a small little unsung town Kington has a great deal of enthusiasm for walking and they really did us proud. They organized Kate Ashbrook, who is The President of The Ramblers, to officially open the trail and all the local newspapers carried advance notice of the opening. The weather was fine on the day and there was a crowd of over a hundred milling around the Market Place. Speeches were made by the lady Mayor of Kington, Kate Ashbrook, and I managed a few words as well. I led the walking party off on the first stage followed by 60 local schoolchildren who were just doing the first couple of miles. Nearly at the end of this stage, just before Weobley, is a fine old timbered house called The Ley, which has some Elizabethan origins. I received an email from the owners about a month before the walk saying that they had heard of this inaugural walk and would the party appreciate some tea and cakes, which certainly made a very nice finish to the day. The book has been very well received and we have got copies into over ten shops and tourist information centres along the route (you can also buy it here too!). We have received quite a lot of interest from walking groups who are making plans to include it in their programmes for next year. It has also been adopted by a new Worcestershire walking holiday company Black Pear Walking Tours, so the future for the trail looks bright. Apart from The Wyche Way I had also agreed to lead for Cheltenham Ramblers on another LD trail, The Geopark Way, which starts up in Shropshire at Bridgnorth and finishes down in Gloucester with much interesting terrain on the way. I got interested in this when I was having tea at the aptly named 02 cafe at The Geopark Centre, which is coincidently right by the Wyche Cutting, which, of course, The Wyche Way passes. The owner is presently organizing a large poster of The Wyche Way to go on the wall of the café alongside the existing Geopark displays. I mentioned in an earlier blog that I had been able to get back to my timber trade roots by purchasing a small piece of woodland in the Blackdown Hills. I had an unofficial option at the time to also purchase another adjoining piece which I did in 2014. I have named them Upper and Lower Harding Woods, after an old Somerset family, whom my family married into in the mid 1800’s. The lower wood does not have so many quality trees but does enjoy great views across to the The Quantock Hills in the north. We have had to do quite a lot of work to establish a new vehicular entrance but there is a short footpath that crosses this wood so we have widened it and provided a stone surface, which was rather fitting, in that I was therefore able to improve a footpath, rather than being critical of the condition, as I have often done on walks in the past. We have also cleared quite a few of the obiquitous birch trees to further improve the views and where I intend to put up a rather larger shed (could be a lodge) in the Spring of next year so that even if I cannot walk quite so much as I might like, I can easily travel down the motorway, and seek solace in my woods. I’m delighted to announce that The Wyche Way book is now available to buy for £7.95 (P&P included in the price). The book is 80 pages long. It’s spiral bound and printed in landscape format to enable easy use whilst walking the trail. It’s packed with full colour maps, photos and illustrations of accommodation and other facilities along the route. Kate Ashbrook, President of The Ramblers and General Secretary of The Open Spaces Society, will be officially opening the trail on Friday the 18th September at 10.00AM at The Kington Walking Festival. I am leading Stages 1&2 of the trail as part of the festival on the Friday and Saturday. Hopefully see you there or send you a book soon! The Wyche Way is a new long distance path that links two national trails – The Offa’s Dyke Path and The Cotswold Way. It will open in September 2015. Note from Guy: The Wyche Way is now open and the book is available for sale. Read more here. The 79 mile trail commences from Kington in Herefordshire (close to the Welsh border) and crosses superb countryside, including the spectacular Malvern Hills, to meet The Cotswold Way at Broadway Tower. The trail is the brainchild of Guy Vowles, who is not only a very experienced long distance walker, but also the instigator of two other long distance trails, The Palladian Way and The Ross Round. Guy first heard of the name from a fellow member of The Cheltenham Rambling Club, who had walked much of the same route in a number of circular walks at the end of the 1970’s. The idea had lain dormant since that time but Guy immediately saw the potential for a great new linear trail. The name is best known from an old ‘Saltway’ crossing of the Malvern Hills known as The Wyche Cutting,but there is also the connotation of Which Way (to go) and there is also an area in the original settlement of Kington close to the church known as the Wych where one can find several buildings bearing the name. 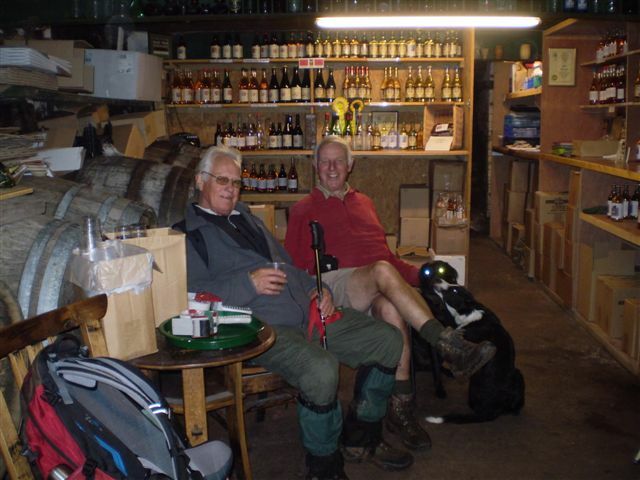 Guy has been greatly assisted by Jim Mason, who is a councillor in Winchcombe, near to the end of the trail. 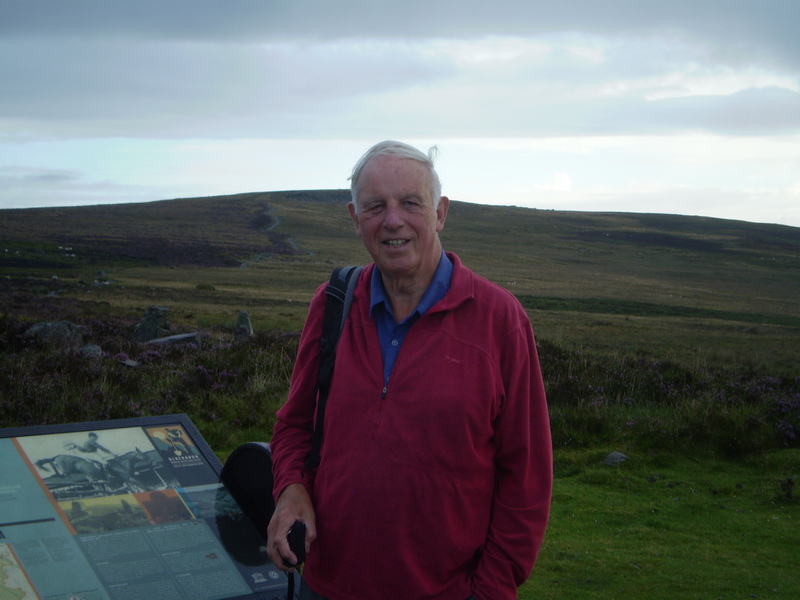 Jim has been much involved in the new Walkers are Welcome initiative (WAW) which is so strong in Winchcombe, and many other towns and villages throughout Britain. Coincidently Kington is also a WAW town and will now have seven long distance trails passing through this small but atmospheric town. The lovely spa town of Malvern is likewise a stronghold for walkers, and is an ideal halfway point on the trail with all possible services available. There will be an official opening of the trail on Friday 18th September as part of the Kington Walking Festival. Please contact Guy at guyvowles@talktalk.net if you would like to attend or find out more. More details of the trail are available at www.guysrambles.co.uk. An affordable guide book of The Wyche Way will be be on sale on the same site from September 2015. Please let Guy know if you would like to pre-order. New Year – New Walks – And a New Direction? It’s been a busy time for me since my last blog with quite a few changes in my walking world. Firstly I decided back in August to close down the AD HOC walking group. I was struggling to get other leaders and was also struggling to fit in my other commitments. It was very successful whilst it lasted but since setting it up the situation at Cheltenham Rambling Club has stabilized with lots more decent length walks, and I also realized that most of my LDWA friends are quite independent and can ‘cherry pick’ their way through the many other social and challenge walks available on a weekly basis. As I mentioned in a previous blog, I had sold out of my Ross Round walking book and have decided to republish it but in a larger format. I approached several publishers without any success but one of them gave me some good advice; ”Where is your new market?” and ”Will the old customers buy another issue which sounds the same”. So, I have renamed it ‘Striding around Ross’ and there are now five interconnecting walks totalling over 50 miles and that includes The Ultimate Ross Round (URR) which is a conglomerate of the Original Ross Round (ORR) plus an extension over May Hill, which makes it up to a marathon distance, and which I still have (forlorn!) hopes of making a route for a major challenge walk. The previous Ross Round book was self-published and I was resigned to repeating this but then discovered my previous printers were no longer in business. However I then discovered, that the Winchcombe Way walking book had been published digitally and got in touch with local printers who have done a really great job on my book with the advantage that the digital process allows the whole format to be viewed almost as one proceeds. We intend to launch the new book in late March and have an open evening at Rossiter Books in Ross planned for Wednesday 27th March. Let me know if you would like to attend? I have also been busy walking over The Wyche Way, which I have mentioned previously, and which is to be walked by Cheltenham Rambling Club over 6 easy stages later this year. I have been accompanied on the walkovers by Jim Mason, and as ever, Anne Ochala. Jim has been particularly keen since he is involved with The Walkers are Welcome initiative in Winchcombe and we have discovered that Kington also belongs as well as Bromyard which is close to the route. We have met up with several of the committee members in Kington and have recently learnt that there may be a new walking centre for Herefordshire, hopefully to be established in Kington, so that apart from The Offa’s Dyke path, and the new Arrow Way, they are also interested in promoting The Wyche Way. Kington is a really rustic little market town, and the first three stages of The Wyche Way pass through rather typical and flat Herefordshire countryside. However, just when you think it may get a bit boring, you discover an unknown Roman road, a new timber frame house being built out of plantation timbers (as shown on Countryfile) and all sorts of other unexpected gems so that it has been far from boring. During stage two we caught glimpses of the Malvern hills in the distance ahead and at our lunchtime stop on Stage 4, which is as far as we have got so far, we enjoyed a very good break in The Wyche Inn, just below the main ridge of The Malvern’s, which was typical of Herefordshire, having no frills, but offering plain good value. The last bit of really interesting news is that at long last, I have hopefully acquired a piece of woodland, and what is more, in a really interesting and good walking area, The Blackdown Hills. For those of you who do not know, the background to this is that when we sold our business, nearly twenty years ago, my friend Brian Wright said “why don’t you invest in some woodland. Your family have been in the timber trade for three generations so put something back in?” I guess at the time, I still had my business hat in place, so we ended up buying another property in Cheltenham where we initially ran a gallery, but which, was later leased out. We sold the property in 2010 and my mind went back to Brian’s original suggestion. 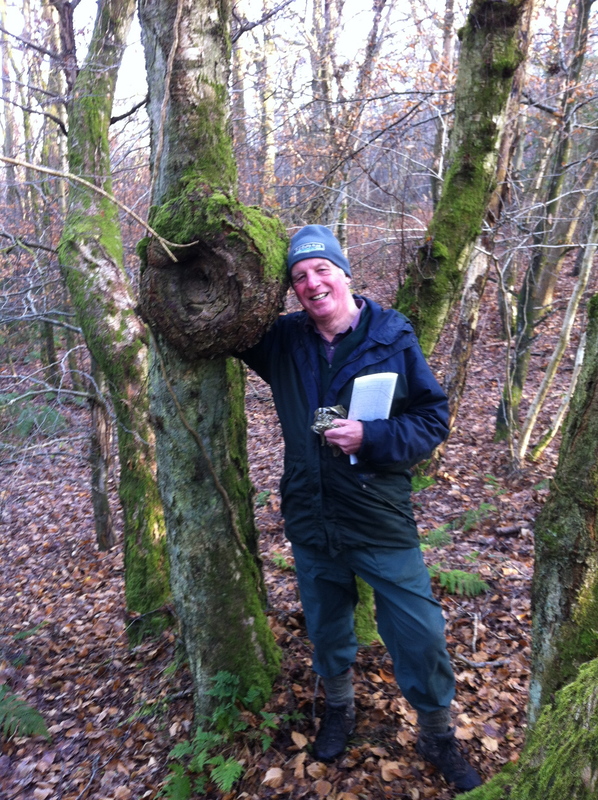 The best woodland in the country is mostly part of an estate or a farm and small parcels are not only hard to acquire but relatively expensive with prices rising steadily over the last decade. During the last two years I have probably looked at about twenty pieces of woodland. One of the very first which I unsuccessfully tendered for, was the aptly named Walkers Coppice. Fifteen acres of really superb woodland with many prime oaks, situated neat Woodstock and owned along with seven other much larger lots by The Duchy of Cornwell. Actually the position was not the best, being in rather too well populated countryside and rather too close to London. The vendors accepted an offer for the whole estate which made my bid (second best anyway) worthless. So, where are The Blackdown Hills? It is an unfortunate fact that many people only know where they are by a motorway, so in this case it is necessary to head south on the M5 and then just past Taunton one can see a striking monument up on the wooded hills to the left. This is the Wellington Monument, built to commemorate the famous general, which is situated on the western edge of The Blackdown Hills. This AONB (area of outstanding natural beauty) is not that large and stretches ten miles in a south easterly direction down to the attractive town of Honiton, previously famous as a centre for lace making. The supposed mantra for a lot of property purchases is position-position etc. I was always looking to get away from it (Gloucestershire) a bit but The Blackdowns are an easy one and a half hours driving, and only just over another half hour to the coast and sea. The aforementioned Brian at Lyme Regis is also less than half an hour way and should be able to help administer any work on the woodland. The woodland is only eight acres and all walkable. (unlike some other jungles I have inspected). Quality of the woodland is regrettably not that good (at present?) with quite a lot of Birch, Hazel etc and not many prime trees but it is 800 feet up and drains well. There are two lanes on either side and a very good pub just a mile down the road. Behind the pub is a large campsite with fishing lakes and a couple of static caravans available for letting out. You may therefore see a little change in direction during the next year from your scribe but whatever, you should still be receiving more news of walks, pubs, and now woodland! A shorter long distance trail, or a great pub crawl? We were booked for the night into The Lion Inn at Clifton on Teme but not before the final “Sting in the tail” when as we left the river Teme we discovered at 5.30 that our village was a further 500ft uphill. We had walked about 17 miles with over 3000 feet of ascent. The Lion was run by a very efficient Lancastrian lady who was all out for business so that she had a guest ale on at £2 a pint and the food was priced at £2,£4,£6.£8.£10 with really great portions. Why cannot more pubs be like this? The next day was slightly easier (still 17m) but with much of the same ridge walking. No pub available for lunchtime but were in at our destination of Bewdley on the river Severn in good time and went for dinner to another good pub The Packhorse which was previously part of The Little Pub group. The Worcestershire Way has changed a bit recently since it originally started up at Kinver which is actually in Staffordshire so that the section down to Bewdley is now The Worcestershire Village Way and the actual WW walk starts at Bewdley. All rather peculiar but it’s something to do with County Council funding or some other burocratic reason! For our last day we were soon at the original end at Kinver with great views from the Trig point of Wolverhampton and Birmingham to the east and we had our lunch by a very friendly tea shop that is situated within the original cave dwellings that were occupied up to the 1960’s. We then joined the Staffordshire Way and having unfortunately passed but not stopped at the interesting Cat Pub at Enville (another brew pub) we finished our day nearly at Womborne with another 18miles covered. We were then collected by a coach for which Wilts branch had generously covered the cost and which was “the icing on the cake” for a really good three days walking in very good company. “Walkers are welcome” towns and villages. Unfortunatelyat the time we were publishing The Palladian Way there was another interesting walk being launched- The Winchcombe Way. I have to say (through gritted teeth) that it undoubtably has the edge, since the two loops of 21 miles make it almost a “must” for distance walkers and all the neighbouring branches of the LDWA have already done it with one branch even setting out to do both loops in one (long!) day. I have recently met up with JIm Mason who is a councillor for Winchcombe (and also now a CRC and LDWA member!) and who tells me that The Walkers are Welcome initiative has been great for tourism in the town with many B&Bs, pubs and cafes showing increased takings. I decided to see if there was a web site (see link above), which is almost mandatory for any aspiring business or organization, and discovered that there were some 80 villages and towns already registered as Walkers are Welcome but more importantly The Chair person is shown as Kate Ashbrook who has been involved in the Walking World for all her life and is currently President of The Ramblers as well as being Secretary of The Open Spaces Society. A formidable lady indeed! It does therefore appear that the WAW initiative is Ramblers based. All very interesting and great for walkers since many of these villages and towns also have their own walking festivals -often only a weekend, but still worthwhile. I would think that there is still plenty of growth potential in WAW and expect to see affiliated towns and villages pass the three figure mark within six months. My Palladian Way sales have slowed down a bit recently but we did receive a useful fillip recentley when we discovered that The East Berks Ramblers were setting out to walk the whole route over two years with coach backup to deliver and collect them for their start and finish. I hope to join them for their October stretch which is from Burford to Bibury. So whenever we get an order from Slough or Maidenhead we reckon it’s probably from an East Berks Rambler. I am often being asked what my next project is. Well it just might be the ressurection of The Wyche Way. This was a connecting LD trail that was thought out by CRC member Fred Wood in the late 70’s and early 80’s. It was designed to connect The Cotswold Way, then in it’s infancy, from near Broadway to The Offa’s Dyke Path near Kington. Fred did the walk with a long series of circular walks but I have worked out that the 72 mile route could be easily accomplished in six days and I intend to start walking it over later this year but from Kington to Broadway so that the main HIGH lights of the walk – The Wyche crossing of The Malverns- Bredon Hill and Broadway Tower are all in front of walkers and provide a suitable ending to the walk. I am also well on my way to finalizing all the content for the re publication of The Ross Round which will now be called The Ross Rounds since apart from the original Ross Round, there will now The Ultimate Ross Round and several other parts of the two routes as well as a new Loughpool Loop taking a rather nice and atmospheric pub The Loughpool Inn (Surprise- Surprise!). I am hoping to find an independant publisher for this since I originally self published the original. Well that’s it for this edition. I hope to publish a few more photos of recent walks in the next week or two. Watch this space. Guy Rambles on…from Nerja to Exmoor…and a little bit of bridge restoration on the side. I guess that blogs are supposed to be rather instant but since I am being badgered by my webmaster to put something, well anything into print, I have decided to follow on from my last walking blog. I was back walking within a couple of weeks and back up to reasonable distances within a couple of months. When people ask me how it is, I say about 80% from perfect, and I now use a walking pole for any serious hill walking. The big worry for walking at the time was the necessity of waymarking 125 miles of The Palladian Way with the book due out at Easter time. However the delivery from China, where it was printed, was understandably late, although the finished product was just great and has been very well received. I did most of the waymarking with my old friend Ken Thomas, from Chester, who managed to find a relative with a spare cottage at Swinbrook near Burford which we used as our HQ for the first half. Private waymarking is a little complex since whilst most county councils do not object to discreet extra signs on their posts, it is often quite difficult to decide which is a private post or which is CC. So in some instances one just has to take a gamble and face the possible wrath of a landowner. I thought that I might get up to ten such cases over the total distance but in fact have only received one vociferous complaint although I guess there have probably been a few signs removed. I have learnt from experience that one certainly does not consider any waymarking on large private estates such as Blenheim! Involvement with the book took up a lot of my time last year and initial sales were quite good with a two pronged attack from publisher Nick Reardon and also my extra contacts. However it is quite surprising how all the necessary freebies to newspapers, magazines, journalists add up. The original 500 print run of my Ross Round book has just sold out after 7 years and I think that the 1500 run of The Palladian Way may take a similar time although my optimistic lady accountant now has me registered as a sole trader with some expenses tax (legitimately) deductable! We keep getting little bits of free publicity for the walk and one of the more interesting items was provided by The Cotswold Conservation Trust who publish a walking newspaper called The Cotswold Lion which also acts as a sounding board for The Cotswold Wardens, who do so much good renovation and repair work on the footpaths within the Cotswold AONB. We were able to get them to put in a handrail down a steep slope and restore an old “Clapper” bridge on our route at Signet just south of Burford. 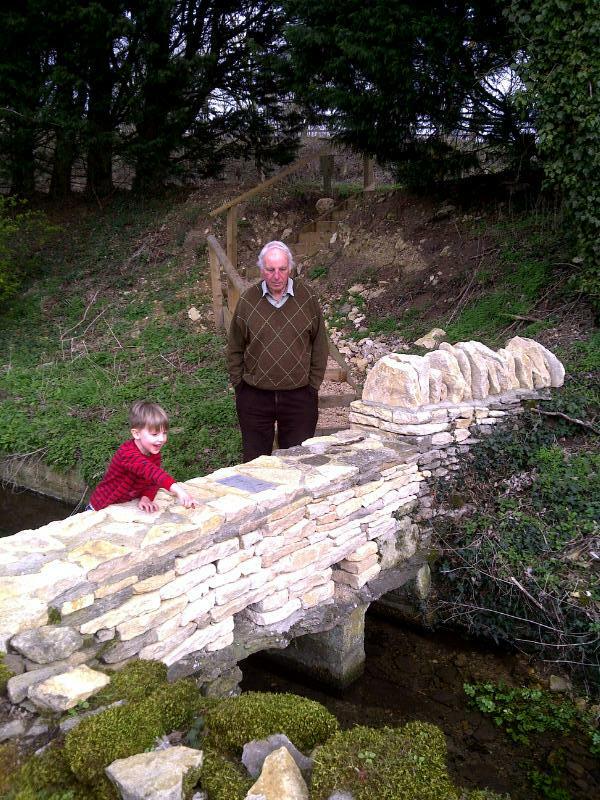 This was funded by an associated charity called Friends of The Cotswolds and I provided a plaque to go on the parapet of the bridge so that apart from setting up a new long distance walk it was nice to be able to provide some small environmental improvement. Last year was also good for the AD HOC walks I had set up and we organized 24 in total. This was originally instigated since my main walking club Cheltenham Ramblers had stopped putting on most of their usual long Saturday walks. However, during the year, the old walks organizor resigned, and they (CRC) have now started offering more longer walks so that with this and the fact that most of our members prefer their involvement with the LDWA, means that my AD HOC group is struggling to find leaders and walks have dropped this year. I may have to do a mailshot to walking shops and gyms etc if it is to continue but having said that we have three walks coming up at the end of April and a possible weekend up in The Staffordshire Roaches in the autumn. Due to my OP I had to duck out of The Crickhowell Walking Festival last year but the party of five whom I had organized had a great time and were keen to repeat it this year. Once again it was a really good week and the weather was also fine. The Festival goes from strength to strength and there are so many features that are good-long walks- lots of variety- easy to understand grading of walks- and of course the familiar faces that one gets to know after a time. I suspect that not all of our “famous five” will be up for it next year and our existing (quite reasonable) cottage is now under new ownership so that we may have to find a new base but I am still planning to go myself. Some friends say that I (or even we!) have the life of Riley as we had to cut short a holiday out in Spain for me to get back for the Crick Fest. We have friends locally who do not like the usual cold weather here in February and who for a few years have been having a month out in Nerja – southern Spain – in the Costa del Sol. The self catering apartment for a month was quite reasonable and we were persuaded to go. There are certainly a lot of Brits out there as well as Germans and Scandinavians but the main thing is the climate and I was in shorts for 20 consecutive days. It wasn’t supposed to be a walking holiday but I had nipped over to The Map Shop in Upton on Severn and picked up a map and book of walks in the area. However, even I, wasn’t prepared for the terrain , which is very rocky, and quite difficult to navigate. I wasn’t prepared to take the risk of walking on one’s own but happily I was in the internet café one day and met an English walker who told me of a Scottish guide who was quite reasonable. Gerry was a very sociable man, of a similar age to myself, who didn’t like to start walking much before 10.00am and liked a drink at the end of the day so I went out with him for 5 days and by the end I was beginning to get an understanding of the area and how the ridges and valleys linked up. The mountains are quite spectacular and go up to over 2000 metres although I only got up to just over half that. I also found an Irish guide John Keogh whom I went out with for one day. He was rather more business minded, also younger and fitter too! L was quite happy whilst I was walking to soak up the sun on the balcony, with an occasional sip of chilled wine, to stop any dehydration! We also found a local “ex pats” type club where we enjoyed several old films and where L played Bridge for a couple of afternoons and whilst we mostly ate in we also found no shortage of local restaurants to try out. We are already thinking of next year! I have also enjoyed two other recent walking weekends in lesser known areas which are worth mentioning. I went down to Exmoor with quite a large party from The Brecon Beacons Park Society and stayed near Dunster. This was my third trip to Exmoor in the last six months and I have become really fond of the area. There is a lot of contrast with this small National Park spread over a lateral area of 30 miles from the east outside Bridgewater (The Quantocks) over into Devon near to Barnstable in the west. On my last two trips I based myself on Exford which is almost in the centre but my favourite place is Dulverton which is on the southern edge of the park. There is nothing very high or arduous but lots of hidden places to discover. I have been so impressed that I have joined the Exmoor Society which seems a worthwhile thing to do and oh, I nearly forgot but there are some great pubs down there as well! When I was with Ken Thomas last year we talked about meeting up and walking again- possibly in Wales, so we went up to Chester recently and I took Ken on an interesting backpacking trip which I had done previously some 8 or 9 years ago. This was a two day trip around and over the Arans which are in mid Wales and just to the south of Bala Lake. We left my car at Llanuwchylyn, which is at the western edge of the lake and traversed around the mountain (14m) to Dynas Mawddwy where we stayed at The Llew Coch or Red Lion, to us English folk. It wasn’t a very quiet evening, or night, since a local farmer had just sold a prize bull for £130K and was throwing a party for 130 friends and villagers in the large function room at the back of the pub. This was unfortunately almost below our bedroom and they were still enjoying themselves at 3.00am! Our route the following morning was almost straight back over the ridge. I say almost, since Ken persuaded me to ascend on another permissary (in places) path which involved a very steep and stony climb but we were rewarded with an unusual bonus at the top in the shape of a most unusual Fox Trap which we were told about the previous night and which was fashioned like a sheep enclosure but with vertical sides, and in the past, a hen tethered in the middle to attract foxes. As we were looking for it, it dawned on me that it was April 1st and we had also just told a family of Germans walkers about it as well but “Thee of little faith”, there it was. 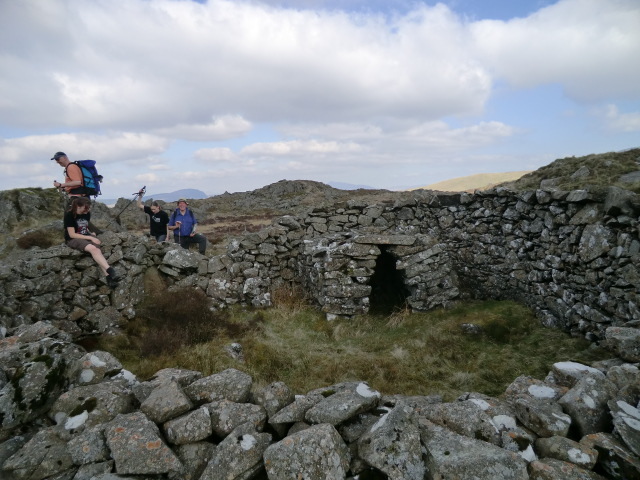 It took another hour to get to the first summit Aran Fawddwy which is just 10m short of 3000 feet and then we continued on to the second summit of Aran Benethlyn which is a bit lower. The views were really great for about 50 miles in all directions and this mountain range is really quite quiet with maybe just 12 or so other walkers spotted over the whole weekend. We only walked about 12 miles but with 3400feet of ascent it took us nearly 8 hours and I found it quite a bit harder than on my last trip. After all this, my next walking is going to be quite uneventful, and will be The Worcestershire Way with Wilts LDWA in May, which I have done twice before but not south to North so I should have some different views. I will let you know about it in due course but it could be another 18 months but I hope not! Guy’s Rambles- first ever blog. Is a Blog a kind of digital diary? In which case where do you start? The beginning of the walking year sounds sensible- so here goes! 2010- A painful start to the new year and decade. Memories fade fast but who can forget all the snow we received just after last Christmas. Walking in snow and high drifts is awfully hard work and I had two long walks here in the Cotswolds before starting off in January to do the St Kenelm’s Way which is a ‘modest’ long distance trail of nearly 60 miles from outside Birmingham down to Winchcombe. I was accompanied by Phil Heneghan (with whom I had walked another of Gerry Stewart’s Long Distance Trails, The Wysis Way – also in foul conditions two years previously). Phil was told by his wife “you must be mad to go and do this walk” but I didn’t have to consider any advice since L was off on a skiing holiday (better use of snow!). It was supposed to be about 19 miles to Pershore, our next overnight stop and progress was slower and slower as Phil helped me over stiles and we eventually walked most of the afternoon along snow covered lanes rather than the uneven countryside and got into Pershore in the early evening. The good news was The Angel Hotel was vastly superior to The Travel Lodge and was even the same price and included breakfast. It also had a full sized bath. We were joined for a drink by Phil’s brother, in a great little local pub called The Brandy Cask which has a fantastic range of it’s own brewed beers. Phil’s brother, who lives quite nearby, saw me hobble up to the bar to get the next round, said “You would be mad to try and walk tomorrow” and I had to agree. He then offered to collect me and run me back to Winchcombe. What a true Gentleman. More snow fell overnight but Phil seemed unperturbed and set off for the last stage of 20+ miles on his own although I said I would come out in the car to Dumbleton to the brilliant café there to see how he was getting on! I called in at the antique shop in Winchcombe where Heather Holmes worked and over a cup of coffee she said my car seemed OK although it was well covered in snow. Alas it was not so, in that someone had skidded into the side of it with more than a few hundred pounds of damage- still to be rectified 6 months later. I drove back to Dumbleton and met up with a Zombie like Phil, who had had to get through 18 inch high snow drifts on Bredon Hill and would have turned back if he could have seen where he had come from! He still wouldn’t give up and eventually walked on to Hailes Abbey where in the gloaming I picked him up. We are planning to walk this last stage together in September when the weather should hopefully be a lot better. Predictably the knee really stiffened up and I made an appointment with a physio in Cheltenham who said that she thought I had torn a cartilage and that I should have a MRI scan to confirm it. We have a brilliant facility- The Linton Clinic- here in the town and by paying privately (no point in hanging around for weeks) I got the scan and results just a few days later. It appeared that apart from a small tear there was also some signs of arthritis and loose bodies floating around in the knee cap. The big question is to operate or not to operate? The specialist said that the tear might heal itself within a month or so and that if they operated it would be several (at least) months before I could get back to long walks. Additionally I knew several other friends who had had the knee clean up operation (Arthscopticy) which had not proved to be a long lasting success and my walking companion Anne Ochala had also recently walked on through a cartilage tear although she is only half my weight! So- a couple of weeks later- with a walking pole- a knee bandage and quite a few pain killers I ventured out for a little 5 mile walk around Leckhampton. Not very easy or comfortable and it wasn’t until February that I managed to walk over 10 miles. The reason I was rather “pushing it” was that I had booked in for The Crickhowell Walking Festival at the end of February and had also booked a cottage for the week so that I had to see if I was up for it!- Find out more in the next blog – walking in Wales. Striding Around Ross is now on sale! Click to subscribe to Guy's Rambles and receive updates of new blog posts by email.